There is no substitute. Superior protection for less. 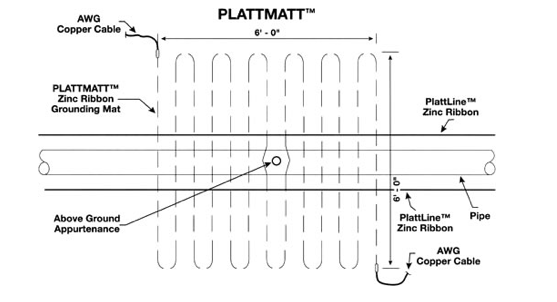 PlattMatt™ is a pre-formed grounding / safety mat made from Plattline™ II Standard, the original zinc ribbon anode. Now available from Farwest Corrosion Control Company, Plattmatt™ sets the world standard for grounding and safety protection. PlattMatt™ is a new product line used for cathodic protection, electrical grounding and safety. PlattMatt™ is made from Plattline™ II Standard zinc ribbon anode that has been pre-formed into 6′ x 6′ or 8′ x 8′ grounding/safety mats. Plattline™ zinc ribbon has no equal in the industry. It is manufactured using a unique process that ensures durability and longevity in the field. PlattMatt™ is used below above ground appurtenances and is attached to the pipeline and general grounding system to keep workers and technicians safe as they move around portions of the pipeline (valves, pipes, rectifiers, risers, test stations, etc.) that are brought above ground. Single or multiple PlattMatts™ can be used depending on the size of the area. Other products presently in use require fabrication in the field and as a result, are labor intensive to install. Pre-formed PlattMatt™ ships with necessary attachments, speeds the construction process and saves money, by dramatically reducing installation time. The above drawing shows the general shape of the mat(s). A single piece of serpentine-shaped Plattline™ zinc ribbon anode forms each mat with the ends bared. Each kit covers a 6’x 6′ or 8’x 8’area and includes #6HMWPE wire pigtails.